A simple yet rewarding ICT activity is to get students to annotate a map of an area with which they are already familiar, or have studied in the field. This activity can be adapted for any age group. I wrote this article because I found it quite time consuming to find good map symbols on the Internet. Having eventually located some useful resources, I then set about refining and improving the activity. Where can I find base maps? There is a bewildering range of web based mapping services competing for the attention of geography teachers. Arguably, the best include Multimap with it's excellent post code finder, maps and aerial photographs. Streetmap.co.uk provides A-Z style maps and the Ordnance Survey's Get a map and the latest technology of Maps Direct provided as a subscription service by ESRI, are also excellent resources. Of course, the drawing tools found in Microsoft Word are perfectly good for drawing your own maps. There can be several irritating problems with Internet-sourced maps. Sometimes they will be served as multiple images which frustrate attempts to copy and paste. Some map images will resist any attempt to sever a hyperlink to the original web site, other sites disable the right click function. Helpful web sites will provide a printer-friendly version of a map, but if not, the solution is to take a screenshot of the active window. Methods vary between operating systems, but pressing Alt and Print Screen in Windows XP does the trick. 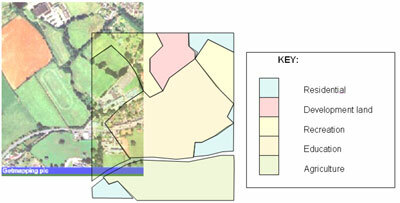 Once pasted into the application of choice, the map can be resized and cropped. All online map data will be subject to copyright. Some web sites such as Get a map permit limited reproduction by teachers for educational purposes but most don't. However students acting as individuals will be able to download and print copies of maps for their "personal noncommercial use" during lessons. Make sure that any copyright notice is retained! Maybe an environment survey of their local area? In both cases the maps were produced with the drawing tools in Microsoft Word (to avoid any copyright problems.) Maps Direct will generate a very detailed outline of your school or local area. ESRI fonts can be found here. (Cartography, Crime Analysis, Environmental icons, Geometric Symbols, Transportation Municipal, Weather (ESRI) In Windows XP simply save the font zip file to your desktop. Right click on the folder and extract it to the Fonts folder (in the Windows folder) It's really very simple! The great advantage of using a font character to annotate a map is the ease with which they can be resized and coloured with no loss of clarity (unlike a bitmap image). This is a helpful site for locating map symbols. The most useful tip is to place the font character into a text box. Right click on the text box and choose Format Text Box. Use the Colors and Lines tab to format the box with no line or fill. Click the Layout tab and choose In Front of Text. The symbol can then be placed on the map without disturbing any other characters or drawing objects. Sending text / objects forwards and backwards by right clicking and using the Order command. Grouping drawing objects (by holding down Shift and clicking on each object before right clicking and choosing Grouping.) This is very useful when drawing your own maps in Word. Once objects are grouped, they will move in unison when dragged to another part of the document. Microsoft Word as a GIS? The skills outlined above can be used to make quite sophisticated maps in Word. By playing around with the Group, Ungroup and Regroup feature, I was able to make a very effective map of a fictitious shopping centre with overlays that can be added or deleted as desired. The map below was produced in Microsoft Word and is composed of four layers as shown by the diagram on the left. The layers can be dragged in or out desired, effectively a simple GIS. This technique would certainly count as a more complex presentation technique for GCSE students concerned with accessing higher level marks for their coursework projects. Each layer is a copy of the base map and every element in the base map has been grouped. In order to change the details the elements were simply ungrouped and then regrouped afterwards. Alternatively, how about this land use map also made in Word? The overlay is draggable and the transparency can be varied. Instructions are here. This activity can be infinitely varied, and results in well presented maps with professional keys and symbols. It is a good ICT activity in it's own right, especially for introducing the formatting and drawing features in Microsoft Word. The activity is creative and fun, and works very well as part of a fieldwork investigation.